Small flowers and small leaves give Adenandra uniflora a delicate look, however it is easy to grow. 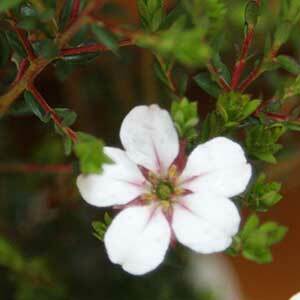 The flowers are white with a rosy red throat, 5 petals and attractive. New flower buds are red and attractive, the flowers do have a mild fragrance, however it is mainly the foliage, best described as tiny, mid to deep green and soft in texture that is aromatic when crushed. This is a plant for the rock garden or for growing in a container. As an added bonus stems are tinged with red and the dried leaves can be used in potpourri. A well drained humus rich soil is best. This is a spreading plant and reach around 1 metre in width, so give it room to grow. This is a species that does not require much pruning however it can be pruned lightly to maintain size and shape. Common Name – China Flower. Position – Full to part sun to afternoon shade. Height – To around .5 metres, often less. Spread – To around 1 metre. Flowers – White with pink. Flowering time – Late winter to spring.